So maybe Cupid’s arrow didn’t hit its mark in time for Valentine’s Day this year. You don’t have to spend February 14 solo watching romcoms while you angrily delete marketing emails for flower arrangements and scroll through Instagram pics of cutesy couples. Like the song goes, “that’s what friends are for.” It’s time to rally all your girlfriends to celebrate Galentine’s Day with you. No boys allowed. What’s Galentine’s Day? According to the character Leslie Knope on Parks and Recreation, “Oh, it’s only the best day of the year. Every February 13th, my lady friends and I leave our husbands and our boyfriends at home and we just come and kick it breakfast style. Ladies celebrating ladies. It’s like Lilith Fair, minus the angst. Plus, frittatas.” So gather your gal pals and we’ll help you with the plan. Traditionally, Galentine’s is the day before V-Day, but for this list we’re covering the whole V-Weekend for maximum lady leisure time options. Stretch your girls night out into a 3-day fest of good vibes and good music. Munifisense Love will transform a warehouse space into a plush bohemian love nest in the heart of Venice, with DJs, dancing, yoga, workshops, and art. A solid lineup of DJs – including Jeremy Sole, Phutureprimitive, and more – will keep you and your ladies grooving. Chocolate is a Valentine’s tradition, and Chocolatier Blue is the perfect place to indulge with your besties. Each little sweet treat here is a work of art, with bright unexpected colors and flavor combinations like pineapple basil and pomegranate tarragon. Get a box of heart-shaped chocolates or an ice cream with a freshly made waffle cone and enjoy it in the cutest little backyard behind their Abbot Kinney shop. Girls? And brunch? A match made in heaven. Chaya Venice is hosting a Broken Hearts Pajama Brunch on Sunday morning, with a DJ, $1 oysters, and punchbowls (mmm those sound dangerous, in the good way). 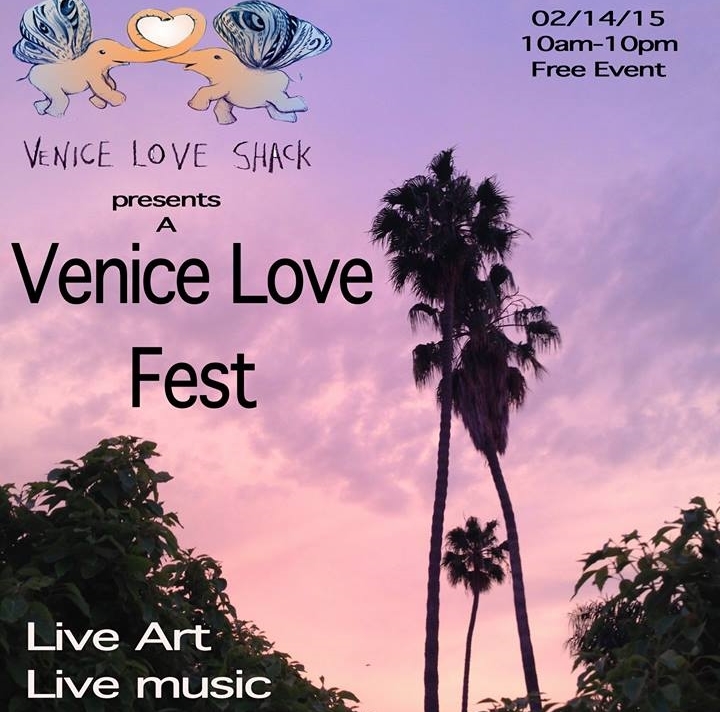 The Venice Love Shack has L O V E in its name, so it makes sense that they are throwing an all-day love affair on Valentine’s Day. From morning to night, the Shack will be shaking with live art, live music, yoga, shopping, and more, making it a sweet spot to meet up with your gaggle of girls and take in the scene. Another boozy brunch option for you and your BFFs to “kick it breakfast style”: the bright and lively scene at Roy Choi’s Carribean-cuisine Venice outpost. Get the girltalk flowing with bottomless mimosas, bloody maries, and rum punch, which can all be mixed and matched. The night before Munifisense Love kicks off in the warehouse space at 585 Venice Blvd., the Create:Fixate crew will throw their 13th anniversary party – a love-themed celebration of art and music, with Adam Freeland as headlining DJ. If you and your girl gang are looking to make some new love connections, the event will also feature a singles mixer aiming to connect creative spirits.